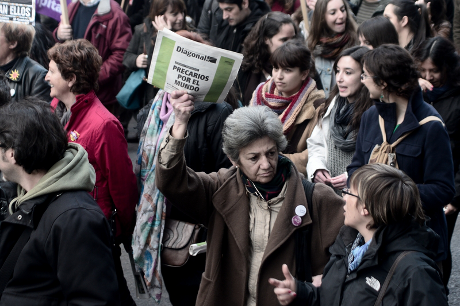 The Eurozone crisis: what way forward? The simple truth unpalatable to Eurozone authorities is that small peripheral EU economies and even big economies like Spain and Italy, are victims, not designers of the liberalised financial architecture that was built way back in 1992, repeating earlier twentieth century failed experiments that led to financial crisis, immiseration and war. “I think in Europe we must all ask ourselves whether the ECB should have the same powers as other central banks around the world,” the Spanish leader, Mariano Rajoy said at a press conference on Monday, April 7, 2013 . Mr Rajoy’s plea for a central bank that serves democratic interests sounds like the plea of the little Dutch boy with his finger in the dyke, begging for the help of a firefighter. The fact is that the Eurozone monetary order has been designed to deliberately deny Mr Rajoy and other European leaders the powers of a ‘firefighter’ - a publicly-backed central bank; one which can act as lender of last resort, and support the public sector as well as the private banking system. Mario Draghi, Governor of the European Central Bank, says that 'stability' is very close. Demotix/Massimo Viegi. All rights reserved. The terms of the Maastricht and subsequent treaties deliberately shrank the economic policy tool kit available to democratic governments. ECB mandates separate Europe’s banking systems from democratic states. This means that, unlike the US and UK, EZ governments are forced to place undue reliance on the private banking sector for funding; and on only fiscal, not monetary policy for managing the economy. Unlike the leaders of totalitarian states, elected authorities must be responsive to democratic forces. To avoid economic failure, prolonged depression and the associated social unrest, it must be possible for politicians and policy-makers to respond and adjust to economic conditions, and to have the economic policy tools to do so. Europe’s leaders are deprived of the ability to respond to democratic forces by the Eurozone’s monetary system and its statutes. They have been stripped of critical policy tools..
And to add to this, the total EU budget of less than 1% of GDP means the Union has no means to express ‘solidarity’ and address depressions in Member States. This is unlike the US, with its federal government deploying a budget of 18% GDP to smooth out differences between states. “The basis for the euro shadow state comes from treaties that many Europeans have never heard of. Does anyone know what the "two-pack" or "six-pack" agreements are? Is anyone sure of exactly what the "fiscal compact" does? The ideological aspirations of the bankers, technocrats and politicians that make up this ‘shadow state’ are utopian, as Karl Polanyi argued so effectively in The Great Transformation. We know, because this is not the first time they have attempted to bypass democratic governments to create an integrated global marketplace for financial interests. Financiers and technocrats corralled politicians to do the same in the 1930s under the Gold Standard: "the Golden Straitjacket." Just as today, their utopianism and dismissal of both democratic institutions and of the immiseration of Europeans led to an intensification of nationalism. Worse, 1930s financial liberalisation and austerity encouraged millions of Europeans to turn to authoritarian dictators who, in contrast to the technocrats, promised employment and the restoration of prosperity and stability. I argued early on (in an Open Letter to the People of Greece: Restore the Drachma , June 2011) that Greece should exit the Eurozone (EZ) and set up a central bank to protect the interests not just of private bankers and bondholders, but of Greek society as a whole. The advice was not taken. Instead Greeks are exiting Greece, including 120,000 professionals. Unemployment at 26.8% is the highest recorded in the EU, which is why Greece’s young, smart and talented head for Australia. Fascists are gaining a foothold in Greek politics. 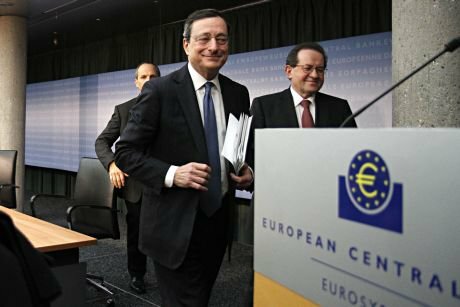 In the meantime the Troika’s clumsy 2012 Greek debt deal led to the fall of another Eurozone domino: Cyprus, which as Costa Carras argues on openDemocracy has become a revealing test case. According to the Greek statistical service, the economy shrank at an annual 5.7 per cent in the last quarter of 2012, adding up to a massive slump of 20 per cent in real terms since 2008. As this goes to press, Greece’s official creditors, the Troika of the ECB, the IMF and the EU, have delayed release of a 2.8 billion euros ($3.5 billion) tranche due in March 2013. Media reports suggest this is because the government refuses to acquiesce to the sacking of another 25,000 public sector workers. Cyprus now heads for collapse, its private banking system felled by the weight of huge debts. The botched bank bail-in engineered by the Troika, caused Cyprus to effectively abandon the Euro. The introduction of controls on both inward and outward movements of capital means that Cyprus’s currency now has a different value to that of the Euro, and cannot be traded freely. The ‘bail-in’ of depositors with over €100,000 – all of whom had their deposits decimated – means that most Cypriot firms have no working capital. Nor is there any chance of raising funds from banks. The Troika’s record as a ‘shadow state’ in charge of economic management of the Eurozone is appalling. As George Soros argues, it has deepened the depression (of the Eurozone periphery), aggravated their debt burden and perpetuated their subordinate position. “As a result the crisis is now threatening to destroy the European Union.” The technocrats, bankers and politicians in charge are in denial of this truth, obvious to any close observer. Such is the fate of utopians. George Soros proposes to convert the entire stock of Eurozone debt into Eurobonds. This would provide temporary relief to EZ debtors, but it would not alter the compulsion on sovereigns to structurally adjust their economies to suit the interests of mobile finance. Throughout the clumsy and botched negotiations, Cyprus was blamed for its reckless and bankrupt banks, and for harbouring a tax haven for Russian oligarchs laundering misbegotten gains. Similar attacks were made earlier on Greece. And these attacks echoed in turn the complaints of international creditors dealing in the 1980s and 1990s with the Third World debt crisis. There was not a single sovereign Third World debtor not considered corrupt, incompetent and fully responsible for the massive post-70s build-up of private and public debts. International creditors, by contrast, were considered beyond reproach; their co-responsibility for the crisis skated over. While it is undoubtedly true that the Greek public sector had grown too large to be sustained by a weak economy; that corruption and tax evasion were rife; that some of Greece’s politicians were cosseted and crooked; nevertheless, Greece’s (and Cyprus’s) debts and finance sectors did not expand and then explode until both countries joined the Eurozone’s monetary order: the Euro. In Greece nominal interest rates fell from 20% in 1994, when the government announced its intention to join, to 3.5% in 2005 after it had unwisely jumped on the Euro bandwagon. Unsurprisingly public and private sectors went on a borrowing spree. International loans to Greece stood at $161bn at the end of December, 2010, down $75bn from a year before. Overseas lenders, excluding those in Russia, had $59.2 billion of outstanding loans to Cyprus, a country of just over 1 million people, at the end of September 2012, according to the Bank for International Settlements (BIS). Cyprus represented low hanging fruit for the global finance sector, and the destination of choice for Russia’s freewheeling oligarchs. Mobile capital flows across Europe’s borders coupled with effective taxpayer guarantees for speculative lending, were as manna from heaven for both Russian oligarchs but also bankers. They were not alone. The Irish and Spaniards likewise could not resist the cheap, easy loans dangled before them. Subsequent sovereign debt crises were highly predictable. There is of course no mystery associated with the €500 note. Mobile, de-regulated money is at the heart of the Eurozone’s economic model, as it is of ‘globalisation’ or the ‘Washington Consensus’. Hence the ease with which drug-dealers, Russian oligarchs and criminals can operate across borders, and even establish narco-dollarised states and regions a la northern Mexico. It must be acknowledged that the Cypriot, Greek and Spanish elites equally relished their new, mobile currency. Above all they rushed to borrow from the global private banking system, at very low rates of interest. They also positively welcomed those freewheeling Russian oligarchs and their billions, and set up businesses to service their interests. Which brings us to another truth about the Eurozone economic model. It was designed to give bankers, investors and creditors the comfort of taxpayer backing and guarantees for all lending. International and domestic bankers were led to believe that Cyprus’s banking system would be back-stopped by the Eurozone; that Cyprus would not be allowed to default; that international creditors could ultimately rely on the ECB doing “all it takes” to defend the Euro; and that an endless stream of European taxpayers could be relied upon to guarantee Cyprus’s debts. As a result of these justifiable assumptions, Cyprus’s private sector quickly became highly leveraged – i.e. burdened with debt. Both banks and households were fully exposed to the property bubble pumped up by the Euro monetary system’s ‘easy money’. The simple truth unpalatable to Eurozone authorities is that small peripheral economies like Greece, Cyprus and Ireland, and even big economies like Spain and Italy, are victims, not designers of the liberalised financial architecture that was built way back in 1992. The reality that the ‘prudent’ northern states of Europe must face is this: the Eurozone’s economic model facilitates easy money, tax evasion, money laundering and fraudulent activity across Europe, while at the same time offering taxpayer guarantees against default; and imposing a one-size-fits-all rate of interest and exchange rate. It’s a model designed to flatter Russian oligarchs, criminals and American hedge funds. It is a model designed to fail democracies, in particular weak democracies like that of Greece. Bergsten has spilled the beans on the crude, ideological aspirations of an elite detached from the millions of Europeans over whom they exercise economic and political power. So, the Eurozone crisis will be allowed to drag on, and to follow the design and progression of earlier twentieth century crises. Back in the 1970s, the weaker economies on the fringe of the global economy were also ‘liberalised’ after the collapse of the stable economic order framed by western governments at Bretton Woods in 1971. (There were no financial crises anywhere in the world during the Bretton Woods era: from 1947 – 71). 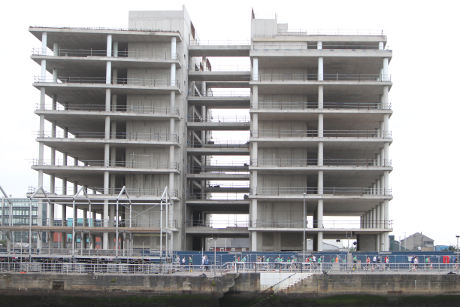 The Central Bank of Ireland has agreed to buy the unfinished Anglo Irish Bank HQ. Demotix/Brendan Donnelly. All rights reserved. But while Bretton Woods led to the ‘Golden Age’ in economics, its architects were hostile to mobile capital. The post-war designers of that economic model prioritised democratic management and regulation of the economy and the finance sector over liberalisation; preferred traders in real goods over traders in money; upheld the interests of the population as a whole and promoted full employment. There was of course a backlash. The world’s financiers found the restraints on capital mobility intolerable. And so a successful economic model was gradually overturned in the late ‘60s and, emphatically in 1971, by President Nixon’s unilateral dismantling of Bretton Woods. According to Eichengreen and Lindert: “the three decades following World War II seem to have been…the fulfilment of the benediction “May you live in dull times”. Neither the bond markets nor the banks were leading agents in the process of lending to ….countries….” With the re-emergence of the old liberal economic order after 1971, things took a revolutionary turn, and financial crises followed with increasing frequency. The debt crises of the 70s and 80s began on the periphery of the global economy, in Latin America, Africa and parts of Asia. Then to everyone’s surprise, the crisis moved to liberalised, de-regulated Japan in 1990, when its massive credit-fuelled asset bubble burst violently. Tens of trillions of dollars were wiped out with the combined collapse of the Tokyo stock and real estate markets. Japan’s crisis was however dismissed as an aberration, and of little relevance to western economies. The Mexican Peso crisis followed in 1995; and then the crisis moved on to Thailand and Indonesia in 1997. From there followed the Brazilian financial crisis and Russian default of ’98 after which the financial crisis gradually moved to the core (New York and London). Easy, de-regulated credit creation inflated speculation so that New York’s stock markets, e.g. NASDAQ registered a 682% increase from January 1995 to March 2000. This easy money fuelled the dot-com bubble which then burst between 2000-2001. Finally, the crisis reached the core, beginning on ‘debtonation day’ August 9, 2007 and climaxing when the global financial system imploded with the collapse of Lehman’s in September, 2008. It was at this point in time, in 2008, that Cyprus joined an economic order that had already ‘debtonated’, but one which the Eurozone authorities continued to defend. George Soros has recently caused some flurry with his proposals for saving the European Union from this euro crisis. So now at least the systemic nature of the political and financial challenge is acknowledged along with its urgency, and open for debate. Before the re-adoption of the neoliberal economic model in 1992 and the launch of the Euro in 2000, Europe’s nation states had money systems that supported their development and sustained the livelihoods of their people. Above all, their monetary systems provided democracies with economic tools that protected the sovereignty and autonomy of the nation. The Bretton Woods economic order did not prevent Europeans from co-operating across borders to ensure peace; or from engaging in more efficient cross-border trade. Nor did those money systems weaken Europe’s social welfare model, or European influence in the world. Today, under the emergence of the old neoliberal economic order, Europe is more divided than ever between creditor and debtor nations. Rather than the promise of convergence, trade imbalances between Europe’s states grow more divergent, dividing north from south. The risk of conflict is rising. The social welfare model is fatally undermined; and thanks to prolonged financial crisis, European influence is waning. Far from promoting convergence, prosperity and peace, the European economic model is now responsible for increasing resentment towards Germany; the demonisation of southern Europeans; and the rise of right-wing and fascist parties. So the question becomes, can those of us who are democrats and greens and for want of a better word, progressives, find the political leaders of Europe willing to wrench leadership away from the neoliberal northern states, and take charge of the European project sacred to all Europeans? Can we find political parties to represent us who are willing to take a joint European-wide approach, whether the countries concerned are in or out of the Euro, and build a pan-European project for inter-union co-operation, economic justice, solidarity and peace? Can Social Democrat political parties and others extricate themselves from their love affair with Thatcherism and Blairism in order to regain political credibility with voters amongst Europe’s working and middle classes? This must involve a complete rejection of deflationary policies bankrupting sovereign nations, and be replaced by the kind of independent, fair (to both creditors and debtor) transparent framework for the orderly resolution of unpayable sovereign debts, proposed by Professor Raffer of the University of Vienna. Such an alliance would mean that a real challenge could be mounted against the old monetary order that once again threatens peace in Europe, and that feeds the monsters of political populism and reaction. Such a force could even form an ad hoc alliance with leaders from the right such as Mariano Rajoy, cited above, leaders starting to realise that the status quo is unsustainable. Collectively they have the power to demand a new, just and democratic economic order, and the treaty revisions that would deliver such an order. They must be free to do so without the compulsion to engage in intra-European ‘competitiveness’ or in ‘exponential growth’. If such demands hit a brick wall, this bloc could ultimately engineer a multilateral exit from the Eurozone, and drawing on their own central banking institutions, introduce a ‘Nuovo Euro’. George Soros proposes that Germany withdraw from the Euro. However Germany has a growing trade surplus with her EZ partners, and withdrawal from the Euro would threaten this advantage. Does Europe have courageous, principled leaders? Could a European leader do what Roosevelt did in 1933 when he refused to attend the 1933 International Economic Conference organised by European central bankers? The conference had been convened to ensure compliance with the neoliberal principles of the gold standard which fixed the value of currencies and forced countries to adjust wages and prices downwards. Roosevelt boycotted the event because, as he argued in a telegram: "the old fetishes of so-called international bankers are being replaced by efforts to plan national currencies" around domestic needs. Only by confident political leadership around a broad alliance for a new monetary order, based on the democratic right of Europe’s people to respond appropriately to crisis, can Europe hope to escape ‘the fetishes’ of bankers; prolonged depression, social degradation, political upheaval – and even war. This political leadership must be based on a renewed understanding of what the European economy is for. It is not for the encouragement and succour of the rich. An economy based on the interests of all who participate in it, will not be hijacked by bankers, Russian oligarchs and criminals. A well-designed economy provides an outlet for human creativity, and meets humankind’s deep desire to work. It exists to nurture and protect the young, the vulnerable and the old – not just the fit and affluent. It helps a society meet and deal with major adversities such as climate change; and it enhances the pleasures of life for all those that live within it. That is what an economy is for. European politicians courageous enough to challenge the ‘shadow state’ would be attacked by the ‘hired guns’ of the economics profession; by bankers, monopolists, oligarchs and their friends in the media; and by politicians who have foregone their right to represent the people. But the offer of a sound alternative to the Eurozone’s economic model and current immiseration would be wildly popular.